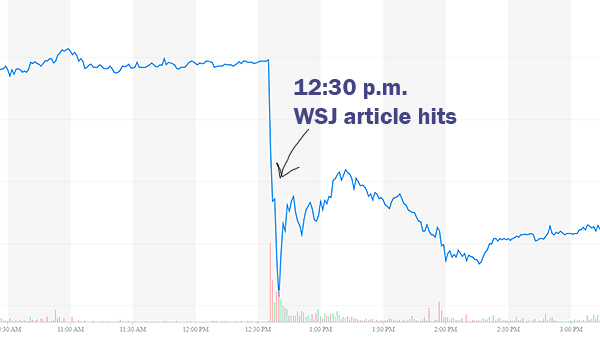 (Image via Yahoo Finance) Kroger, and most other publicly-traded grocery retailers, saw a steep drop in stock value immediately following the article. At approximately 12:38 Eastern Standard Time, the world of grocery stocks took a deep breath…and dropped. Just minutes before, the Wall Street Journal broke a story saying Amazon’s launching a new grocery banner. The drop was immediate, and steep – and while most values recovered by the close of trading on Friday, there’s going to be a lot of talk about a story based on a rumor and some real estate leases. Everyone’s been wondering why we haven’t seen much movement by Amazon in the grocery sector after its $13 billion acquisition of Austin, TX-based Whole Foods Market Inc. finalized. The acquisition sent grocery stocks reeling for months. Retailers rushed to get into the e-grocery game, sending San Francisco-based Instacart through the roof. And then…nothing…or very little, at best. AmazonGo launched, but that’s way niche and not intended to replace a full grocery. AmazonFresh pulled out of markets. Sprouts Farmers Market dropped Amazon as its delivery fulfillment and switched to Instacart, and Whole Foods killed its own loyalty program, adopting Amazon Prime discounts instead. It recently announced plans to convert 365 by Whole Foods Market, the discount banner, to standard Whole Foods stores. The latest earnings report from Amazon even suggested physical store sales aren’t meeting targets. So, why grocery? Why now? Was this the end game all along? Some of the retail analysts I follow think so. It seems to me that Amazon’s been doing what it does best – digesting data. Acquiring Whole Foods gave it unprecedented access to the nitty-gritty details of the grocery business. Even though Whole Foods is a niche retailer, they still know more than a little about the brick and mortar grocery business, and grocery shoppers. Not intended to compete with Whole Foods. The next few weeks, and months, will be a wild ride in grocery.